Your safety at sea can never be taken for granted. That’s why safety is one of the cornerstones of the Sargo brand. When your choice is Sargo, there are no compromises made as to how solidly built and well-equipped your boat is. You will always be leaving the harbor on board a very safe vessel. The idea of rigorous quality is one of our core values. Moreover, Sargo standard means that we deliver a generous list of features and equipment. Every Sargo boat is standard-equipped with a multitude of safety features: a complete set of the latest navigation instruments, a bow thruster (28’-36’), an automatic power trim (PTA) and marine window defrosters. 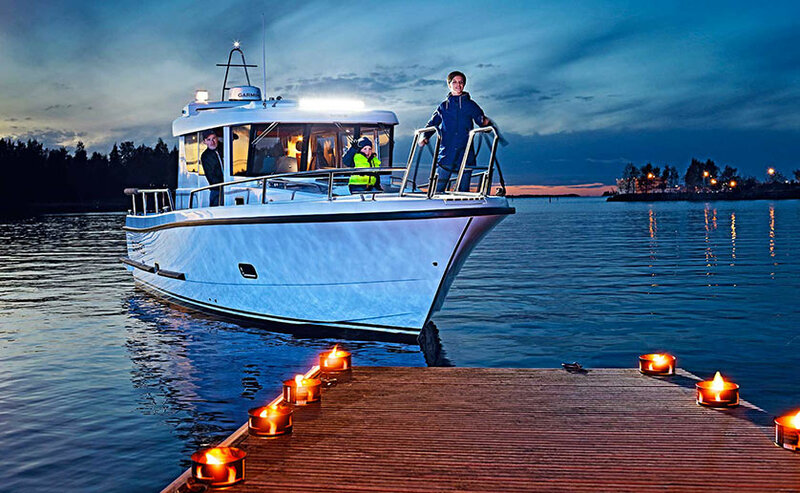 What’s more, all larger Sargos (28’-36’) delivered offer as standard three independent batteries, each in their own compartments, for the service, engine start and bow thruster functions – just to enhance your safety. All of our models have a certified installation of world-renowned Volvo Penta diesel engines, ensuring the ultimate compatibility between the stern drive, engine and the Sargo hull. Naturally, there is a very comprehensive list of optional equipment to customize your Sargo to your own specifications. Mr. Thomas Sarin, CEO of Sarins Boats Oy Ab, son of Edy.